Gorgeous picture, Amy. I am very partial to Scottish scenes. Thanks for sharing! You're welcome Kay! And I am so with you on loving Scotland! I truly feel like either I've lived there in a previous life or I am meant to live there in this one. I've always felt such a connection to Scotland. Stunning photo!! I'm totally with you on that Amy. I told my husband that I swear I had to have been English in a past life because I feel such a connection to the UK that doesn't make sense. I only got to visit Edinburgh last year and was left breathless! I really want to see the rest of Scotland ♥ What I did see was amazing!!! Isalys...want a roomate in the UK? heehee. I think the only way I will get my husband oversees is if Pearl Jam is playing there! So jealous that you visited Edinburgh...my favorite castle of all time is Holyrood and I really want to go there! It looks so peaceful ! Thanks for shoring ! Absolutely stunning. 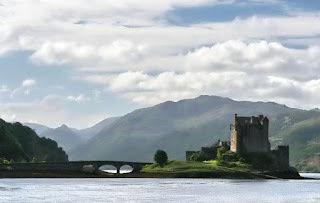 I would very much like to visit Scotland. Oh, I so want to go to Scotland! Such a beautiful view. Anyway, I have an award(s) for you!